The SD40-2 was introduced in January 1972 as part of EMD's Dash 2 series, competing against the GE U30C and the ALCO Century 630. Although higher-horsepower locomotives were available, including EMD's own SD45-2, the reliability and versatility of the 3,000-horsepower (2,200 kW) SD40-2 made it the best-selling model in EMD's history and the standard of the industry for several decades after its introduction. 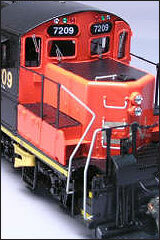 The SD40-2 was an improvement over the SD40, with modular electronic control systems similar to those of the experimental DDA40X.